Brickhouse, like many young people in the Elizabeth City area, is involved with the Arts of the Albemarle’s Center Players program. The Center Players is AOA’s award-winning performing arts program offering children and young adults an after-school education in dance, drama and music in a nurturing environment. From there, he only got more involved, performing in numerous productions with the Center Players, and essentially growing up in the program. Now, he’s performing in a regional production with a theater company based out of Virginia Beach. 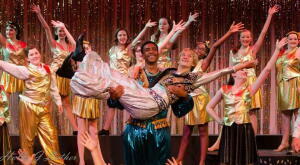 Several students, like Brickhouse, have gone on to perform in larger productions, attend college to study performance and even find full-time careers in the performing arts. 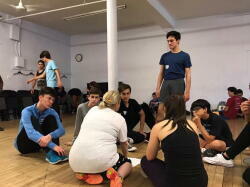 For years, AOA’s Center Players program has been supported by generous funding from the Northern Albemarle Community Foundation, Women Givers of Northeast North Carolina, David Bosomworth Performing Arts Fund, Judge Thomas Watts Memorial Endowment, Winifred Jones Wood Endowment and HCWGMW Endowment.